“Did you win? !” asks my son after each race. Perhaps the concept of being a minnow in sea of sharks, and competing more against yourself than others, is hard for a six year old. It is sweet, though, to think about how optimistic young children can be about our abilities. In the six years since I broke the 15 minute running barrier, I have maintained a gentle, upwards trajectory of improvement, in terms of both stamina and speed (or, in my case, reduction in slowness ). Race deadlines more than discipline are to credit and blame for this barely perceptible growth. Even with haphazard training, I always do enough to heave myself across the finish line; with each event, my baseline level of running ability improves, if only a bit. But he’s also correct: if I trained harder, I could win. Not in a podium way, but at least compete, instead of complete. Not in the top three, but the top third, maybe even in the “top quartile” (per age and gender group, of course–improving performance by shrinking the pond, heh, heh). Lose 20 pounds instead of 2, drop minutes instead of seconds! 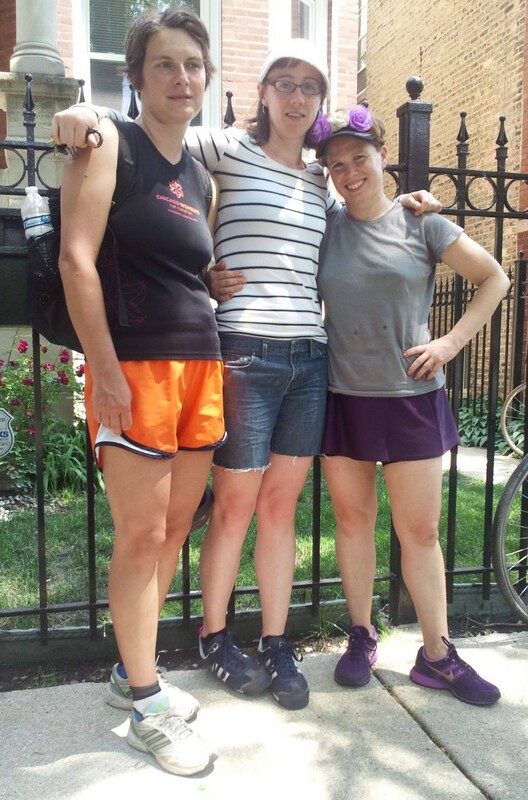 For once cross the finish line before my fleeter, and more disciplined, running pals, Clare and Megan. Pancake filled after this summer’s half marathon (thanks, Scott!) I came in third. Suspect I will eat Clare’s dust this weekend, too. Each time I sign up for the race, I promise “This time it’s going to be different!” I will do speedwork, tempo runs, and long runs. I will work my core, stretch my hip flexors, and pamper my Achilles. I will eat to maximize performance, recovery, and (healthy) weight loss. I am sure I will eventually do all those things for a race. But, apparently, not for the 2013 Chicago marathon, a month and change away, and most definitely not for the half-marathon I am running this weekend, where I most certainly will not outrace Clare. In fact, between a recent bout of plantar fasciitis and more recent bout of strep throat (NSFW), I have barely run at all in the last few weeks. This is not good. Fear of a DNF at the marathon is starting to scratch at me. But I am not giving up hope. Being sick helped me drop two pounds–that can count as a performance booster, yes? (hmm, but maybe it was muscle. . .) I have plenty of experience achieving other ill-advised, daunting feats for which I was under-prepared. I have never not been able to cross the finish line. So I am going to do some crash training in the next few weeks, write about it, and see what happens. Oh, Gin – don’t even think of a DNF! You did it once (without hitting “the wall”, no less), and you can do it again. You have a tremendous fitness base. We can always theoretically train better, but as amateurs, there are definite limits. Do what you can, and put it out there! Thanks, Julia, you are always so supportive.